Our listing guide of Mobile CAD Authoring apps for iPad includes a fairly short list of tools, an index of the difficulty of programming successfully in this category. When it comes to the Apple iOS devices–both the iPhone which came first and the iPad which came after–the tendency in the industry is to view drawing creation on these devices with a healthy bit of skepticism. This is partly because Steve Jobs firmly believed that a stylus pointing device was a failure in the creation of the product (a partially correct view). However, our fingers are quite a bit fatter than the fine lines normally associated with CAD drawings and the precision that CAD is famous for requires a depth of cursor control that makes vectorial drawing challenging with fingers alone. Despite this fact, many developers remain fully committed to the idea that–yes–it is possible to overcome this handicap and make a fantastic CAD authoring app for touch-based devices like the Apple iPad. As you will see from the list below however, none of the CAD authoring apps for the iPad come from any of the major CAD and BIM software developers serving architects worldwide, except the Pro subscription version of AutoCAD 360. As was partly explained in our 2010 feature, “The iPad: How the CAD/3D industry is being changed”, 10 August 2010, most of the major CAD industry executives feel that the iPad is a cloud-based device whose purpose is to discover new uses in both old and new contexts and for software to be developed to serve those new contexts. In this category a CAD authoring tool is a “vectorial-graphics” drawing tool which allows a user to begin a drawing from scratch and is not a site survey CAD tool which is focused on auto-generating drawn data from the iPad’s camera or other electronic devices. We will have a separate list for such apps. 01 – iPocketDraw by the maker of RealCADD is one of the more highly rated CAD authoring apps options and comes from a well-established desktop CAD maker. 02 – GraphPad Pro has gained some attention as one of the early entrants of CAD programs on the iPad. We have written about this on Architosh. 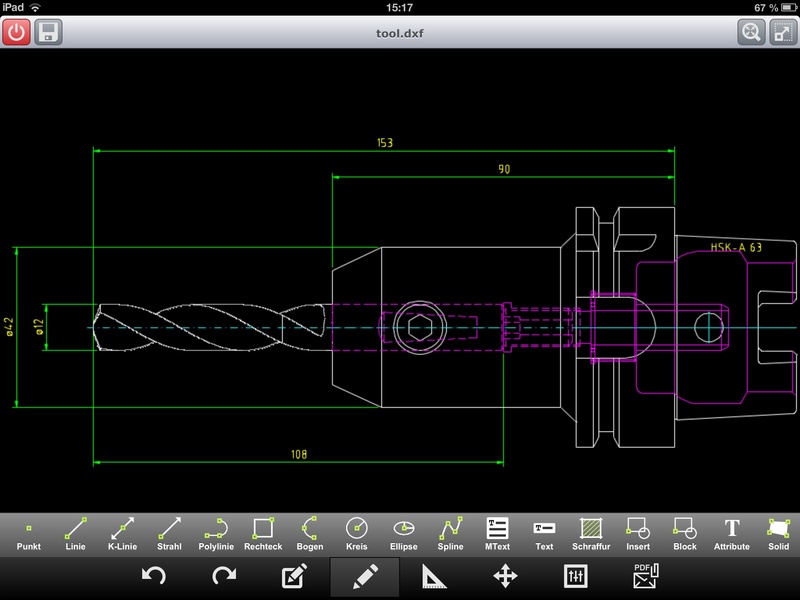 3.1 – biiCADo Touch Pro is a new CAD authoring tool for iPad out of Germany and looks pretty solid. Still, this CAD authoring question lingers. Do professionals in particular wish to use an iPad for starting and making CAD drawings in the field or just on the couch? Is there really a market for “authoring” in the way we already know there is a market for “viewing, editing and markup”? Going back to the Steve Jobs quote above about our ten fingers, CADO by Orange Juice Studios in London strongly believes people do want to author CAD on the iPad and has solved the fat finger and precision problem. Additionally, Grabert of Germany also is rumored to have a mobile CAD authoring solution as is DraftSight by Dassault. Where the iPad version for DraftSight is at in terms of development is a good question but it has been years since Dassault first showed it at an event. Is there a Gem in this group? Perhaps you readers can write us and advocate for one tool of your liking. At this moment we don’t feel this particular category is getting the attention it deserves. Clearly from the reviews on the App Store folks do want to create CAD drawings from scratch on the iPad. And they want a really great mobile CAD authoring environment. 0x – Autodesk’s AutoCAD 360 now supports document creation with Pro subscription plans making it a true mobile CAD authoring tool. Autodesk is clearly close to creating such an environment but from our view they are focused, correctly, on all the tasks users want to do with an iPad and CAD files in the field. And predominantly that centers on other non-authoring functions. We are quite interested to see what the folks at Orange Juice Studios create with CADO. The tool, which we are told is just months away from being submitted to the Apple Apps Store for approval, appears to be both powerful and simple to use.